Your technician Paul was extremely helpful and efficient. He called us in advance to tell us exactly when he'd be arriving and then arrived bang on time! He both diagnosed and fixed the problem with our dishwasher very quickly and then kindly took time to advise us what do ourselves if we had a similar problem in the future. Similarly my initial call to your company and my call to you this morning were dealt with in a very friendly and professional way. I will definitely use your company again! "Super Mario and his crew arrived and left in about 2 seconds - did everything brilliantly with no fuss. Yusuf has now connected everything up and given us a demo re using this terrifying machine. So we are all set - and will certainly recommend Harris Electrical and their team to anyone. Jeremy just told me to add “what nice people”. Thanks very much"
The next day is so unusual now but you managed it with ease. Can't thank you enough. I will in the future shop locally at your store. "You and your team have been really great and helpful through this process. Thankyou!" "Hi, I just wanted to say thankyou for the great, helpful, service and good communication I recieved from the staff in store. Please especially thank Scott & Dan who installed the Blomberg integrated fridgefreezer today. Being a basement flat it was not an easy job and i am very grateful for their skill in installing and disposing of the old unit. Many Thanks"
"It was a pleasure to meet with you and tap into your obvious experience. Your knowledge of what is available, ability to match that with your customer’s needs, and communicate it with enthusiasm, made our journey well worth the effort." "Pretty darned good actually. And less hassle than John Lewis much as I love them too. As someone else said, nice to buy locally, and they put up with my faffing about." "Customer service here is impeccable and the item we bought was same price as big online retailers but you get the great service and local feel to go with." "Ordered several white goods and new oven for new a new home. Prices were competitive, service helpful including suggesting alternatives when something wasn't available and the team stored the items free for several weeks. Nice to buy locally." "Really helpful, professional and friendly! Highly recommend." "They were very patient as I dithered a bit on deciding what to buy, but they very helpful, and once I decided organised everything. I would definitely use them again." "Just taken delivery of a large fridge freezer into tricky basement location. Well-known online retailer previously refused delivery when they arrived on our doorstep and saw more than 6 steps involved! Cue panic as our old fridge was dead. Went to Harris who arranged site visit, purchase and delivery of fridge with a matter of days at same price as online retailers. Everyone we dealt with was super-helpful and we will definitely head back there when the need next arises." "I have been using Harris Electrical for over the last 10 years, however I wanted to try an online supplier that advertised a next day stress free purchase. This couldn't have been further from my experience, not only were the telephone support staff rude, condescending and rigid they arrived at my property looking for any excuse not to deliver the appliance. Thank goodness for Demiz and the wonderful staff at Harris, no job is to small or too big, they took their time advise a site survey and made a plan for getting me the appliance I wanted, at a competitive price delivered to my needs. I cannot recommend them any higher than to say you need not look any further than 62-64 Lower Clapton Rd." "John and Debbie helped me in a time of need and I can't thank her enough... I always recommend them to my friends and family.... Thanks again HARRIS"
"We would definitely like to purchase all appliances from you, you have a great reputation locally. Tired of Internet shopping!" 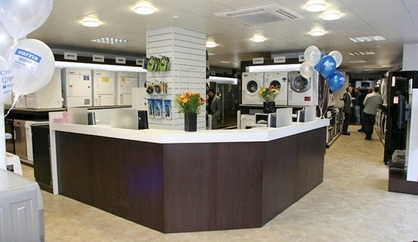 "I just wanted to thank you for the great service we received, when we came to buy our washing machine this morning. This is the first time we have come to you and I plan to come back the next time we need to buy any electrical goods. I initially phoned yesterday and had a very good response from Jonathan, who dealt with my enquiry in a prompt and efficient way. He promised to call me back with all the relevant information and he did so, very promptly and in a really friendly way. I asked lots of questions and he patiently went through everything. When we came into the shop, everybody was friendly and it was an all round good experience." "Excellent service very easy to use website, the staff were very helpful and friendly both in person and on the phone. Would definitely recommend this website to anyone who wants a professional speedy service. Thankyou." "Fabulous. You guys are fantastic. And I forgot to say this morning, that it was also you who very kindly put promotion posters for my partner's art show (at the bookshop) in your shop. We have been buying from Harris Electrics for over a decade now, and from the very first time we entered your shop, we've been blown away by your incredibly professional service and competitive prices. I'm delighted to say that since we left Clapton and moved a little further away, to Walthamstow, you are still our first port of call for all electrics and white goods. You are highly appreciated and valued, and we're delighted you're still going." "I just spoke to my son again and he couldn't lavish enough praise on the service you gave, the helpfulness of your colleagues who fitted the machine, and the performance of the dishwasher itself. He and his wife are most grateful for everything you and your team did, and your phone number has gone into their little black book for the next time one of their appliances dies. So, many thanks for your help and guidance, and for the efforts of your colleagues, your service was greatly appreciated. Thank you." "I purchased a Beko Washing Machine on 2nd February 2013 and from the minute I arrived in your shop the service I received was amazing. The staff were very helpful and friendly and when I phoned to change my mind and go for a a 7kg instead of a 6kg of the same make they made it easy for me to do so. I also wish to say that the delivery people were extremely curteous too and the whole experience of shopping at your store has been a very happy. By the way I'm pleased with my choice of washing machine too. Thank you all so much. An extremely happy customer." "HUGE thanks for ALL your time and efforts on our behalf. Best wishes"